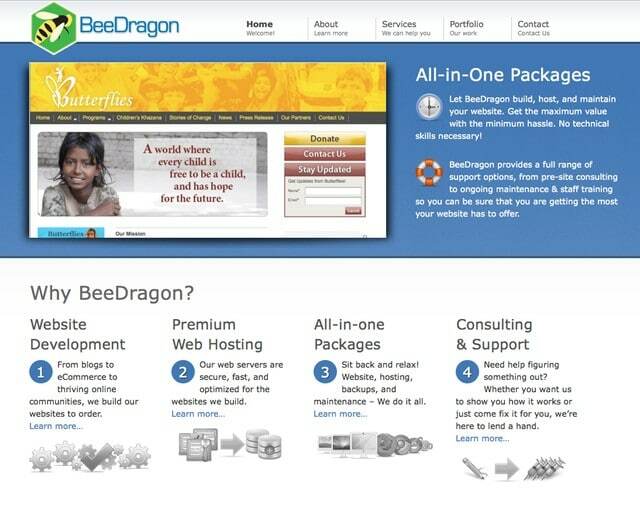 2010 has been the most successful year yet for my business, BeeDragon Web Services. I have been getting a lot of work from other web developers and designers. It is very exciting getting to work with talented people who do similar work. When each person combines their unique skills, we make each other’s work shine. With the growing popularity of open source software, I have been able to focus on building sites with WordPress and Drupal, and to greatly increase my skills in taking these platforms to the next level for my clients. Once again, my business site has become outdated. The web development business is incredibly fast moving. One of my favorite things about this job is that I am continually learning new technologies. 2010 has been an especially exciting year for web development with the growing browser support for HTML5 and CSS3, as well as new releases (or near releases) of both WordPress and Drupal. I am still working on the site, but for the most part it is done. I would like to thank Sallie Goetsch (aka The Author-izer) for helping me with much of the copy that fills the site, and as always, Karen, for being supportive, helping with the words, editing, and helpful suggestions. 2010 – v6.0 – WordPress 3.0. Once again, updated to reflect the work that I do. New design, focus on WordPress development, All-in-one website and hosting packages added, Portfolio updated.